The R-Engine-A (RA) is intended for OEM applications requiring high speed, mass data storage, and up to 40 channels of analog data acquisition. It is ideal for precision data acquisition, industrial process control, and battery-powered solutions for applications requiring mass data exchange. 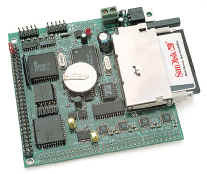 The R-Engine-A (RA) is a high performance C/C++ programmable controller with a 16-bit external bus. The RA design uses parallel ADCs which directly interface to the high performance CPU via a true 16-bit data bus allowing for a single I/O instruction per 12-bit ADC reading. A CompactFlash card, up to 1GB, can be inserted for mass data storage. A total of up to 40 analog inputs are supported. Three high-speed 12-bit parallel ADC chips (AD7852) can be installed, each chip providing 8 channels analog inputs (for a total of 24 channels), with up to 300K samples per second. The AD7852 includes sample-and-hold, a precision internal reference, and has an input range of 0-5 V. Two 16-bit ADC (ADS8344, TI) chips provides a total of 16 single-ended or 8 differential analog inputs (0-5V, or 0-REF) with 65536 counts of resolution and a max sample rate up to 10 KHz. The RA features fast execution times through 80MHz 186 CPU, 16-bit Flash and 16-bit battery-backed SRAM. A 50-pin CompactFlash receptacle can be installed to allow access to mass storage CompactFlash cards (up to 1GB). 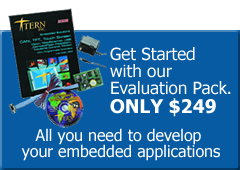 Users can easily add mass data storage to their embedded application. FAT12/16 filesystem support is included within the software development package. Three RS232 serial ports are available by default: a dual UART (SCC2692) and a single CPU internal UART(default as DEBUG port). All UARTs have deep FIFOs to minimize the potential of receiver overrun or to reduce interrupt overhead. The UART also incorporate 9-bit mode for multi-processor communications. 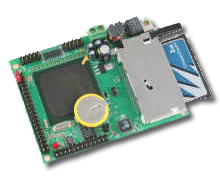 A single UART can be buffered by RS232 (as default), RS485, or RS422 (for an additional charge). 40+ TTL I/O lines are free to use, including 24 bi-directional I/Os from the PPI (82C55), 32 multifunctional CPU internal PIOs, and TTL I/Os from the DUART. A parallel DAC (DA7625, 5 ms, 4 ch, 12-bit, 0-2.5V) and 2 serial DACs (DAC7612, 2 ch, 12-bit, 0-4.095V) can be installed to support a total of up to 8 analog outputs. 40+ TTL I/Os, battery, real-time clock.